Six years later, when Thomas was ten, his father died, the day before his last child, Padraic, was born. His mother, Catherine, or Katie as she was known locally, trained as a midwife to support her young family. As was the custom the wider family circle came to her aid and relatives took some of the children. Thomas was looked after for a number of years by his uncle and aunt, Willie and Elizabeth McNamara of Killerduff. An intelligent and studious child, Thomas attended Ballycastle Boys NS and in his final year was put forward for a County Council scholarship.2 His success allowed him to enter St Muredach’s College as a boarder in September 1925. More success followed with an award for the results of his Intermediate Certificate. It was in St Muredach’s that he first began to consider the priesthood and, in later life, often commented favourably on the opportunity for reflection and prayer offered by the college retreats, a time that helped his decision for priesthood to focus. Once asked to what he attributed his vocation, he responded, ‘I’d say the retreats in St Muredach’s College and particularly the silence’. McDonnell’s next contribution to the Irish Ecclesiastical Record was entitled The Catechism in our Schools and was written a year after his appointment as Diocesan Examiner of Schools.7 In the article McDonnell forcibly makes the point that The Maynooth Catechism was out of date and totally inadequate for its purpose: ‘The Catechism is too stiff and theological in its language, it lacks order and cohesion, its text is extremely and unreasonably puzzling to the children’. His fears for the revision were that the new catechism then being compiled would present ‘technically accurate formulas of faith and apologetics to be memorised’ rather than ‘a knowledge of doctrine suited to their (children’s) years’. To make the children learn what was beyond their capacity was, he argued, against the first principles of educational theory and, he added, the assumption that, in later life, children will remember formulas they have learned is ‘quite invalid’. McDonnell’s advice was three-fold: ‘Firstly, give the children matter suitable to their years; secondly, give it in the simplest possible language; thirdly, do not give it in the question-and-answer form’. McDonnell was amazed to discover that children could have all the Catechism off by heart and still have no real knowledge of Christian doctrine worth speaking of. In McDonnell’s view the question-and-answer formula was ‘putting the cart before the horse’ because answers to questions ‘should proceed from the child’s knowledge instead of being used as a method of imparting it’. McDonnell’s conclusion was that the rote-memory method did not impart real knowledge. It was, in some sense, a measure of the man that his views were ignored and the question-and-answer format, which has done so much damage to religious education in primary school, continued during his long spell as religious examiner in primary schools. Could it be that the bored riposte of ‘Next’ which invariably followed a wrong answer was indicative of an understandable lack of confidence in a system he had lost confidence in but which, out of loyalty, he felt compelled to operate for many years? During his early years as a priest McDonnell lived in a little cottage in Rakestreet, Kilmurry in Crossmolina Parish and there, under a tin roof in the humblest of dwellings, he entertained classmates William Conway (later cardinal archbishop of Armagh) and Patrick Mulligan (later bishop of Clogher) and introduced them to – or, more accurately, encouraged them in the pursuit of – the doubtful pleasures of poker, golf and fishing. He moved to Ballina in 1951 and continued as Diocesan Examiner until his appointment as a curate in 1957 and later as Administrator of the cathedral parish in 1961. During his years as Administrator he was manager of Ballina Boys NS and was thrust into the forefront of an on-going heated dispute between the Irish National Teachers Association and the diocesan authorities over the latter’s unilateral decision to appoint a Marist Brother to replace the retiring lay principal. McDonnell, as manager, didn’t help the situation at the start of his tenure as Administrator by quoting in Latin, without translation, from the Code of Canon Law to back up the defensive arguments of the diocesan authorities. Even though no priest in the diocese knew the primary teachers better than McDonnell his failure to empathise with their position was interpreted by them as a form of betrayal. In his first few Lenten pastoral letters, McDonnell’s low-key, traditional approach was evident. ‘It is unwise.’ he wrote in 1971, ‘to cast aside time-honoured practices without very serious reasons and without making sure that there is something to replace them’. So he followed the tried and tested path of his predecessors in writing Lenten pastorals and keeping to the themes covered by Patrick O’Boyle and James Naughton. In his first letter, he lamented the decline in vocations, blaming ‘the blatant sexuality of our times, the permissive ethic, and the flood of pornographic print that is upon us. These things discourage a boy and make it harder for him to embrace total chastity as a way of life’.12 Another reason for the decline was, he wrote, ‘that the troubles in the Church and the well-publicised defection of a small number of priests, have confused and upset people and discouraged boys from going for the Church, and perhaps even caused their parents to discourage them’.13 It was, for the time, an astute observation. In 1971, McDonnell made a number of appointments: Mark Diamond, Director of Ecumenism, May 1971; Padraic Loftus, advisor to church choirs, July 1971; Paddy Tuffy, director of Emigrant Services, July 1971; George McHale, Director of Catechetics, July 1971 and a month later sent him to Corpus Christi, London for a course in catechetics; John Gilroy, William Moyles and Vincent Moore, Buildings Commission, October 1971.16 A year later, 1972, he accepted the retirement of Andrew Dodd of Crossmolina and appointed James Gilvarry, CC, Bangor as Administrator of Kiltane. Later that year he requested the retirement of James Kilgallon, 80, of Kilmore Erris but Kilgallon hesitated though the following summer, June 1973, he agreed to retire. After the clerical changes of that year, 1973,17 and 1974,18 the transition from O’Boyle’s time was complete. In just over three years McDonnell had made in all almost forty changes. One of McDonnell’s first decisions as bishop was to respond to the criticisms of priests living in the college to the standard of accommodation there. Shortly after his appointment he called the college priests to a meeting at his house and listened attentively to their concerns, particularly the lack of rights of residence at certain times of the year (like Christmas) and other basic conditions. He immediately directed the college president to institute the necessary reforms. Another decision was to organise the creation of the first Council of Priests, no doubt influenced by Cardinal Conway, who was anxious that the new structures envisaged by the documents of the Second Vatican Council would be put in place. The members were Ben McLoughlin (Chairman), William Moyles, Edward MacHale, James Gilvarry, Patrick Gallagher, Padraic Loftus (Secretary) and Michael O’Horo. Almost immediately a problem arose. Reasonably enough the secretary presumed that the minutes would be circulated to the priests but McDonnell objected on the questionable grounds that the proceedings didn’t really involve them, specifically ordering a reluctant Padraic Loftus, then secretary of the Council, not to distribute them. McDonnell eventually relented when the logic became obvious and, at a meeting of the Council of Priests on November 11, 1971 the breakthrough arrived in the following decision: ‘The meeting was unanimous in thinking that a synopsis of each Council meeting should be circulated to all the priests in order to maintain a keener interest and encourage a greater input from them’. McDonnell was uncomfortable in the public role into which his appointment as bishop had thrust him and the growing demands for change, in the light of the recent Second Vatican Council, exacerbated his discomfort. A man of conservative disposition, he was sometimes rescued from it by an easy openness that derived from his clear and incisive mind and his knowledge of church history. When John Neill, later Church of Ireland Archbishop of Dublin, was appointed Bishop of Tuam, Killala and Achonry in 1986, a meeting was held between the two bishops and their clergy, at the instigation of Canon Mark Diamond, Diocesan Director of Ecumenism, at which Bishop Neill, an advisor to Archbishop McAdoo on ARCIC (2), the joint Anglican and Roman Catholic Committee on the Eucharist, spoke on belief in the Eucharist. In the ensuing discussion, McDonnell surprised many by indicating that he could see no difference between his own faith in the ‘Real Presence’ and Bishop Neill’s exposition of his faith in the Eucharist. Those who knew McDonnell well, however, were not surprised as they were aware that his intelligence was sometimes wont to get the better of his conservatism. It was a telling moment. McDonnell, however, remained nervous of change and any deviation from the tried and tested way unnerved him. An example of this was his decision, in 1975, to re-institute the ban on dancing during Lent, a harking back to the Ireland of the 1950s, if not the pre-war years. Indeed earlier than that, in the 1920s and 1930s, the dance-hall was a constant target for episcopal warnings and it was not uncommon for bishops to lay down precise regulations governing them. In August 1953, for instance, Archbishop Joseph Walsh of Tuam, instructed his people that, as from October 1, 1953, all dance-halls in his diocese, whether or not in the control of the clergy, should close not later than midnight in winter and 1am in summer. This brought Tuam into line with similar regulations in other dioceses, including Killala.19 When it was pointed out to McDonnell that the owners of commercial dance-halls in 1975 would not heed his pronouncement he insisted that parish halls should close anyway. McDonnell seemed ill-at-ease in a changing world and gave the impression that he would have preferred the life of a bishop in less demanding times. In 1978, in an interview with The Word, he commented: ‘We (bishops) are killed with reading reports and documents. We have more to read than our eyes can deal with. The invention of Xerox has destroyed us’. Another example of McDonnell’s nervousness of change was the muted controversy among the clergy of his diocese over the refusal of a number of young priests to sit what was known as the ‘Curate’s Exam’. For the first five years after ordination the tradition of the diocese was that curates would sit a written examination. In 1972, the Junior Priests – Kevin Loftus, Peter O’Brien, Deaglán MacConghamhna, Gerard Gillespie, Michael Cawley, Brian Conlon, Michael O’Horo, Padraic Gallagher, Michael Flynn – were told to assemble on April 7 at 10am in St Muredach’s College to sit an examination on the following subjects: Sacraments of Baptism, Confirmation, Eucharist, Penance, Extreme Unction; Gospel of St Matthew; history of the Church in Ireland from the Reformation to Catholic Emancipation; and were to present six homilies in writing. The curates demurred from what they regarded as a slightly offensive and patronising practice. They argued, reasonably enough, that after their recent theological studies, newly-ordained priests were the least in the diocese in need of theological updating. McDonnell refused to accept what he deemed to be a challenge to his authority as bishop and demanded that the Council of Priests reprimand the young priests. ‘What’, he asked the priests, ‘would the people of the diocese think of them’? The Chairman of the Council of Priests was Ben McLoughlin of Ardagh, a wise and much-respected priest in the diocese. His investigation concluded that there was no challenge to the bishop’s authority and that the matter should be allowed to rest. McLoughlin’s calmness and authority among the priests ensured that both bishop and priests found credible ways to overcome what, at the time, appeared an intractable dilemma. Subsequently McDonnell quietly abolished the exam and substituted another more amenable format. While McDonnell was uncomfortable in the forefront of change he was also anxious to move when change was proposed. In the early 1970s the Irish bishops discussed the question of lay ministers of the Eucharist. It was clear that it was only a matter of time before their introduction to cope with the extended and unwarranted time it took to distribute Communion at some Sunday Masses. In Enniscrone, in a busy summer season, the curate Mark Diamond personally asked McDonnell for permission to involve the local nuns in this ministry as the distribution of Communion was taking up to twenty minutes at busy Masses during the summer months. At first McDonnell gave Diamond permission but at the eleventh hour withdrew it again, even though soon afterwards he announced to a diocesan conference that it was imperative not to be seen to be the last to introduce lay ministers. In other ways, McDonnell was adept at pushing out a series of unlikely boats. He was an avid reader who kept abreast of theological, scriptural and liturgical developments and his knowledge of church history presented him with a perspective against which to measure and test change. He welcomed and encouraged the liturgical changes that followed Vatican Two and the re-design of the cathedral sanctuary was given a high priority after his appointment as bishop, though many traditionalists did not easily forgive him the destruction of the majestic marble pulpit – apart from a few republicans who had bad memories of being denounced from it. He encouraged congregational participation and recognised the centrality of good liturgy in sustaining the faith of the people. As a member of the Episcopal Commission for Primary Education he encouraged and delighted in the new catechetics, with the breadth of vision and grace to concede the limitations of programmes he had spent twenty years encouraging. His appointment of Mark Diamond as Ecumenical Director was far-seeing and effective and he encouraged joint initiatives with other mainline Christian churches. At a time when there was much discussion of the legacy of Ne Temere his policy on inter-church marriages was reasonable and accommodating and was much appreciated by clergy and people of other churches. However, in most areas McDonnell was a traditionalist. His appointments were invariably ‘safe’ and predictable and followed a set and trusted pattern. Seniority and balance were the key values. ‘From time immemorial’ was a favourite phrase and it summed up an approach and a policy that he pursued in many different areas of diocesan life. As things were, so they would be. It wasn’t a policy attuned to the changing times or sensitive to the growing expectations of people and clergy. McDonnell was nervous, for example, of the growing authority of the Council of Priests, either because of Ben McLoughlin’s quiet leadership and his decision in favour of the younger priests in the disagreement of 1972 or because the bishop’s natural edginess made him nervous of things getting out of hand. A few years later, in response to a growing unease among the clergy, he authorised the Council of Priests to meet in his absence and to make recommendations to him on a range of different policy areas. The Council invited all the priests to forward whatever they believed the Council should discuss at a meeting arranged for November 24, 1977. Suggestions were summarised under seven headings and a report sent to each priest. Age-group meetings were held between January and September 1978. In October, the findings were summarised and circulated to the priests who were asked to indicate one of three responses – approval, qualified approval or disapproval – to twenty-seven statements. There was massive approval for a range of proposals that seemed sensible and realistic but McDonnell systematically rejected every one of them apart from reducing the number of priests’ conferences from five to four each year. At the time many priests felt that a series of heavy doors were being slammed in their faces. McDonnell’s response was, as ever, cautious, in line with his temperament and general approach to life. Another example of his caution was his refusal, despite persistent promptings from the priests, to tamper with the system for the remuneration of the clergy he inherited from his predecessors. It was obvious that the system, favouring the PP over the curate in a two to one ratio, was inherently unjust not just in the two to one divide but in terms of the level of collections in ‘good’ and ‘bad’ parishes. And in some lucrative parishes, parish priests were earning exorbitant amounts of money. This had the effect of encouraging the unedifying jockeying for lucrative positions and the unease created when curates in some parishes were earning more than parish priests in other parishes. Despite efforts to get the system revised, in line with similar revisions in other dioceses, McDonnell held firm, rejecting motions placed before the Council of Priests like: ‘The meeting strongly recommended that active steps be taken to examine in detail the present system of remuneration for the clergy in the light of the adjustments made in (the dioceses of) Tuam, Elphin and Achonry’. McDonnell’s refusal to countenance any revision of the system of remuneration for priests (even though the need for revision continually surfaced at priests’ council meetings) or examine other social or pastoral areas that the vast percentage of the clergy believed needed critical analysis and immediate action, produced at the end of his episcopate – in reaction to his refusal to contemplate change – a ten-point plan agreed by the priests of the diocese on April 9, 1987. McDonnell’s resignation had been accepted by Rome early in January, 1987. On the morning he received the letter from the Nuncio stating that his resignation was accepted a priest called to discuss some business with him. 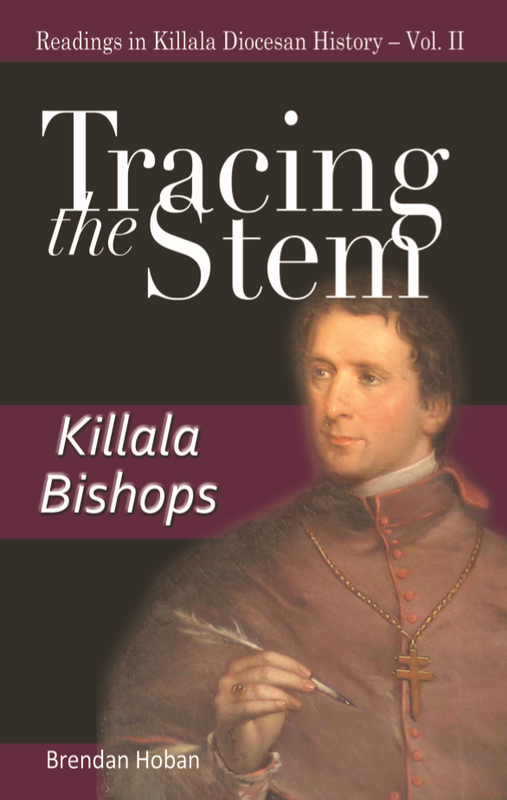 When he entered the sitting-room where McDonnell was seated, before they even exchanged greetings, McDonnell handed the priest the letter and said simply, ‘I am no longer bishop of Killala’. There was no emotion just, in typical McDonnell-speak, a straight forward statement of fact. The Holy Father has accepted my resignation and the see of Killala becomes vacant today when Osservatore Romano makes public the Holy Father’s acceptance. The administration of the diocese now devolves on the Consultors, who for this diocese are the canons of the Chapter. And so I am asking the Chapter to meet in my house on Monday next, January 26th, at 5 pm. They will first choose a chairman because the deanship is vacant at present and then proceed to elect an administrator. Please read the relevant parts of the Canon Law before coming. There was some unease among some of the clergy that, in the transition to a new episcopal dispensation, the priests of the diocese would have little say in the appointment of a new bishop or in the policies he would follow. Twelve Killala clergy20 met and decided to convene a general meeting of the clergy of the diocese. A letter21 was sent to every priest in the diocese. The meeting was held in Gortnor Abbey, Crossmolina at which 37 priests22 – over seventy per cent of the priests of the diocese – were present. The meeting had been called by a representative group of priests but when the priests assembled in Gortnor Abbey a problem arose. As vicar general, Edward MacHale, had not been requested or informed about the ad hoc process that culminated in the calling of the Gortnor Abbey meeting and he voiced the opinion that the meeting was not validly constituted in that those who called it had no authority to do so. The Nuncio responded on April 14, 198724 stating that he would forward the letter to Rome. That the diocese review the (current) situation regarding unemployment and emigration. An implicit critique of the McDonnell years, the proposals – carried almost unanimously – were an expression of the frustration of a significant percentage of the Killala clergy with the slow pace of change and were meant to bring the diocese into line with comparative developments in other dioceses. McDonnell’s successor, Thomas Finnegan, shortly after his ordination as bishop intimated that he was grateful for the proposals and would implement all ten resolutions. In the summer of 1985, a wet and dank season, following a reported moving statue in Ballinspittle, Co Cork, a number of alleged apparitions took place all over Ireland.26 A month later The Western People reported27 that a number of teenagers saw a statue of Our Lady moving in the grounds of the Church of Christ the King, Knockmore. In response to a request for a comment from the Western People Bishop McDonnell said: ‘I have no time at all for moving statues. It’s far too easy for people, especially children, to imagine movements when it is suggested by somebody – and children are notoriously suggestible. It can also do harm to religion’.